Hello there, thanks for calling by. Today I have some cards & a "Card Box" to show you that we will be making in our February card classes. 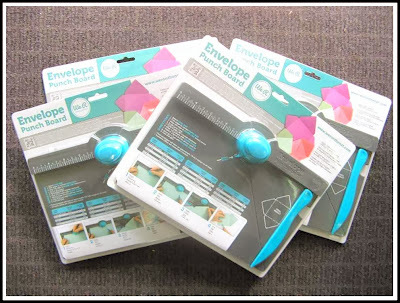 This month, instead of making our usual three cards, we are going to make two cards & a "card box" for when you have a bulkier than normal card that an envelope doesn't quite accomodate. 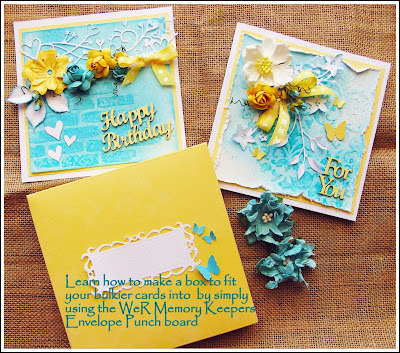 This card box is made using our WeR Memory Keepers Envelope Punch Board which we sell in our shop at The Entrance. As well as making sixty six (66) different size envelopes, this little tool will also make lots & lots of different size "card boxes" to fit any size card. So if you have one of these tools, make sure you bring it to class with you. If not we can lend you one. Too easy. For our cards this month we are going to do a little "mixed media" using gesso, texture paste & mists to create our own card backgrounds. I just know you will enjoy this class. in one of our card classes this month. The cost is $30 which includes all product & equipment.